In this post we’re going to see how to create a game module for Unreal Engine 4. Imagine that modules are containers for a collection of related classes. After you’re done with this tutorial you can read more about the pros and cons of multiple module creation in Unreal Engine 4 in the official documentation. This post was written in 4.15 version of the engine. Depending on the time you’re reading this, this information may be outdated. Update for 4.20 version: As a lot of people mentioned in the comments this tutorial was outdated for versions 4.18+. I have updated the code snippets and introduced changes where necessary. Before you move any further, make sure to close the project you’re currently editing. So, let’s get started! To modify the .uproject file right click on it and open it up using a text editor of your choice. Save your file and let’s create the Module Build File. //Public module names that this module uses. //you should add the core,coreuobject and engine dependencies. Depending on your needs, you may need to add more dependencies to your module later on. Moreover in the 4.20 version, you may need to delete your Binaries and Intermediate folders and re-generate your VS files from the .uproject file. This is the header file of our class. Save it inside the Public folder we’ve added before with the same name as your module (in my case this is the OrfeasModule.h). Thank you for that tutorial, I was wondering how to do that! But I have a question regarding modules in UE4. Is it possible to pass data between the modules? I mean, I wanted to connect my game with a web api, so moving that functionality to another module, different from the game module. Would that be possible? I think that you can connect your game with a web api by moving all the corresponding functionality to a module dedicated for this particular use. 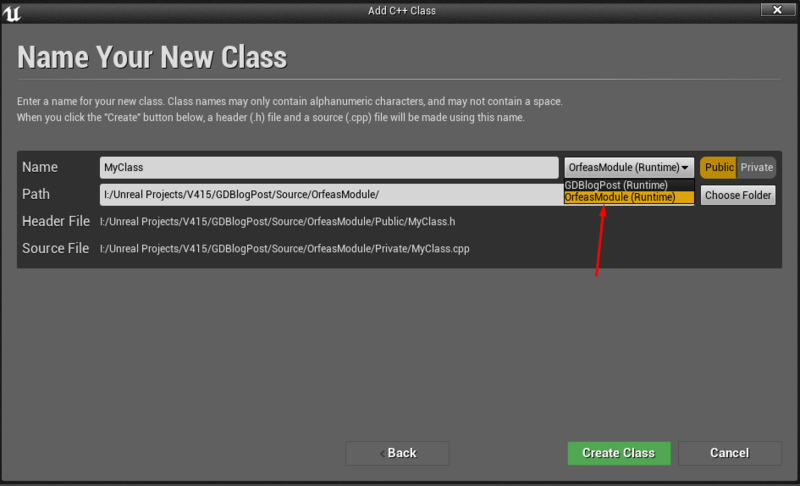 Then, you could make backend calls to your web API from your game’s module by using the created module as a middleman. Seems also need add our module to Target.cs file. 1. Created a new c++ project called it GDBlogPost -> This contained the default module GDBlogPost. 2. Created the OrfeasModule .h and .cpp files. 3. Modifed the .uproject file to include the ‘OrfeasModule’ as you show. OrefeasModule is missing would you like to rebuild -> I click Yes. Could you help, please Im using 4.15.3. I can’t seem to get this to work, even after the suggestions for 4.18 above…. Post has been updated for 4.20 version. I had to open -projectname-.Target.cs and add my module name to the additional modules list.